Shaken? On the rocks? Blended? Invite customers to enjoy their margaritas any way they choose with the South of the Border Invitation, part of our South of the Border Event Kit. Bright colors form a red, white, and green background with sprinkles of confetti. In the foreground of the template, a little Mexican flag waves from the edge of a frosty margarita. Salud! 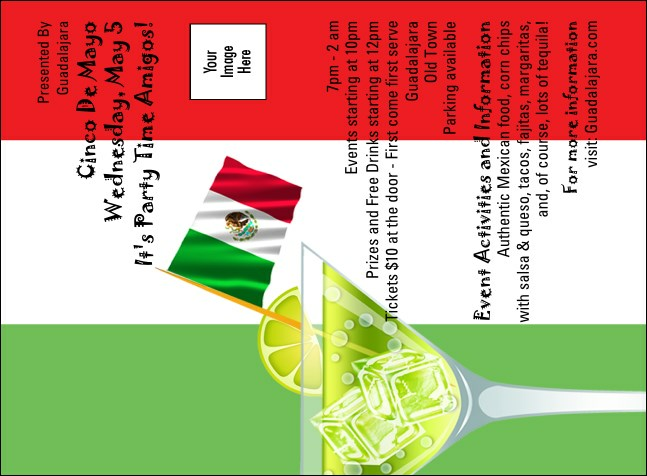 Get the fiesta started with Invitations for all your parties with TicketPrinting.com.